Thousands of employees and customers of Grameen Bank protested in Bangladesh on Saturday over the sacking of Nobel laureate Muhammad Yunus as head of the microfinance institution he pioneered. The 70-year-old economist was dismissed as managing director of Dhaka-based Grameen Bank by Bangladesh's central bank last Wednesday in what his supporters said was the culmination of a vendetta against him. Grameen Bank workers and customers formed peaceful human chains across the country, police said, carrying banners calling on the government to stop its "harassment" of the 2006 Nobel Peace prize winner. "We protested against the government's attempt to oust Professor Yunus. We think his dismissal is politically motivated and part of a long campaign to humiliate him," said Nurul Amin Khandaker, a Grameen Bank accountant. 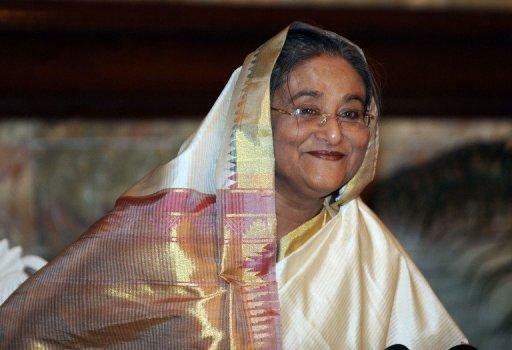 Supporters say Yunus's troubles stem from 2007, when he floated the idea of forming a political party, earning the wrath of Prime Minister Sheikh Hasina, who has publicly disparaged his work. Khandaker, an organiser of the protest, estimated that around 20,000 of the bank's work force and customers took part in Saturday's protest. Police had no precise total for the demonstrators but said the number was in the thousands as protests were held in scores of cities and towns. In the port city of Chittagong, "protesters, mostly officials and clients of the bank, formed a peaceful human chain by linking hands," Inspector Ruhul Amin told AFP. The protests came as Bangladesh's main opposition party called the dismissal of Yunus part of a "conspiracy to destroy the Grameen bank" and US Senator John Kerry, who heads the powerful US Senate foreign relations committee, added his voice to international concern over Yunus's treatment. Kerry said he hoped the government and the Nobel winner could reach a "compromise" on the issue. "I am deeply concerned by efforts to remove Muhammad Yunus as managing director of the Grameen Bank," Kerry said in a statement. "The international community will watch this situation closely and I hope both sides can reach a compromise that maintains Grameen Bank's autonomy and effectiveness." Grameen Bank, which is 25 percent state owned and employs 24,000 people, provides collateral-free loans to eight million borrowers, the vast majority from rural areas. Since its launch in 1983, it has paid out more than $10 billion to its mainly female clientele, making it the largest micro-lender in the world. 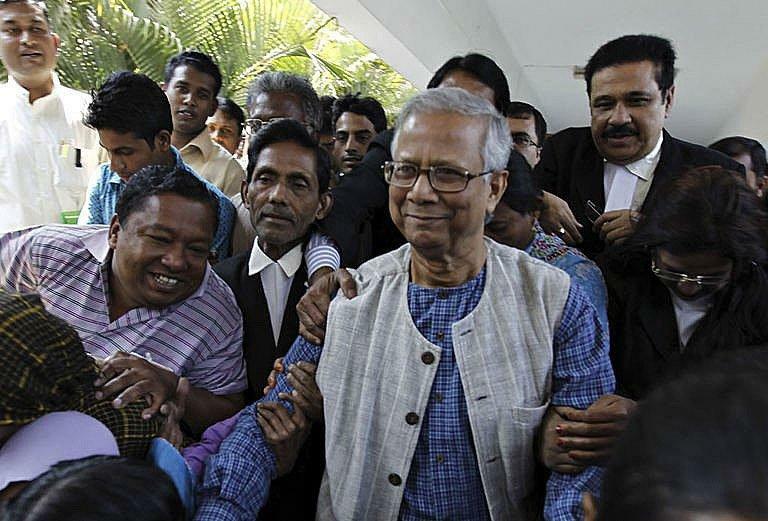 Yunus defied the Bangladesh central bank order and returned to work on Thursday at Grameen's headquarters before lodging a case in the High Court contesting the legality of his dismissal. The court is due to rule on Yunus's dismissal on Sunday. Yunus has launched a legal battle against the central bank's efforts to remove him from his position as Grameen Bank managing director over a technicality dating back to 2000. Moudud Ahmed, a senior official of the country's main opposition Bangladesh Nationalist Party slammed the government for sacking Yunus. "The government has taken the move to take control of the bank. Eventually, it will only compound woes of the poor people," Ahmed old reporters.